“Claws” Struthiomimus, an ornithomimid dinosaur, is nicknamed after the three wickedly long, sharp claws on each of this dinosaur’s hands - equipment which seems quite capable of catching, holding and shredding prey. For more information and pictures go to the Interesting Info Struthiomimus page. 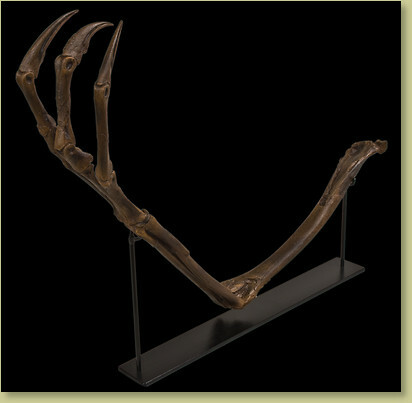 Credit From the original specimen nicknamed CLAWS, collected and prepared by Black Hills Institute, and on display in The Museum At Black Hills Institute. Notes Photo represents what this cast may look like if finished for display. Custom painting and/ or mounting are available upon request, for an additional fee. Please contact us with your questions.